My friend, Bill, wrote to me last week after several months of silence. He has been in Georgia, in basic training with the Army. Not your typical recruit, Bill is 38 years old, has two kids whom he loves dearly, and has practiced successfully as a lawyer, with cases all over the world. Beyond the age for acceptance into an officer's program, Bill did the next logical thing when the urge to join the military hit him -- he enrolled as an enlisted infantryman. 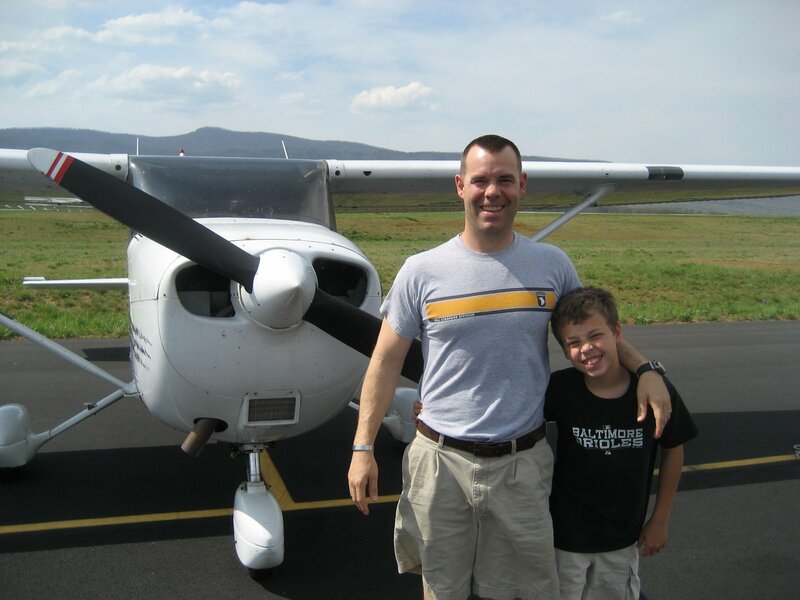 I typically cannot reserve a plane on such short notice, but it so happened that someone canceled a reservation for 30YR ("Yankee Romeo"), a newer Cessna Skyhawk, that had covered the whole weekend. I jumped on it and reserved the plane, then confirmed with Bill. Sunday dawned beautiful -- hazy but with clear skies and light winds. I headed to the airport to preflight Yankee Romeo in advance of Bill and Liam's arrival, then met them by the FBO. Bill looked fitter (trimmer) than I'd ever seen him, the picture of health after the rigors of boot camp. We all grabbed bagels and breakfast sandwiches, then walked across the ramp to the plane. I walked around the plane, naming various parts as I untied it, then opened the passenger door. "Cool!" Liam exclaimed when he first saw the instrument panel. I took my time helping Liam get situated in the right seat and briefing him and Bill on how to use the headsets. I showed Liam the map, explaining about the ADIZ, restricted airspace, and pointing out the mountains along our route of flight. Lining up at the end of the runway, we accelerated and lifted off to the southeast. 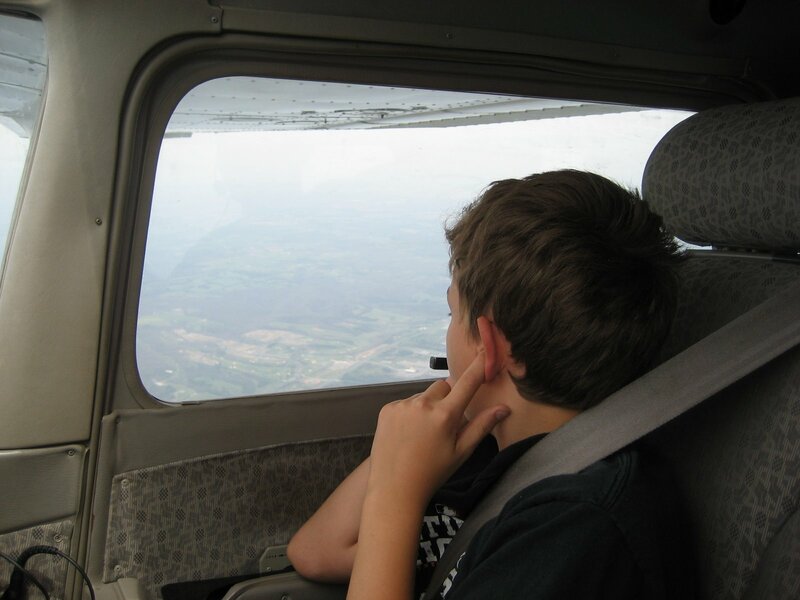 We had climbed a couple hundred feet before Liam took his eyes off the instrument panel and looked out the window. "We're off the ground!" Bill chuckled from the back seat. 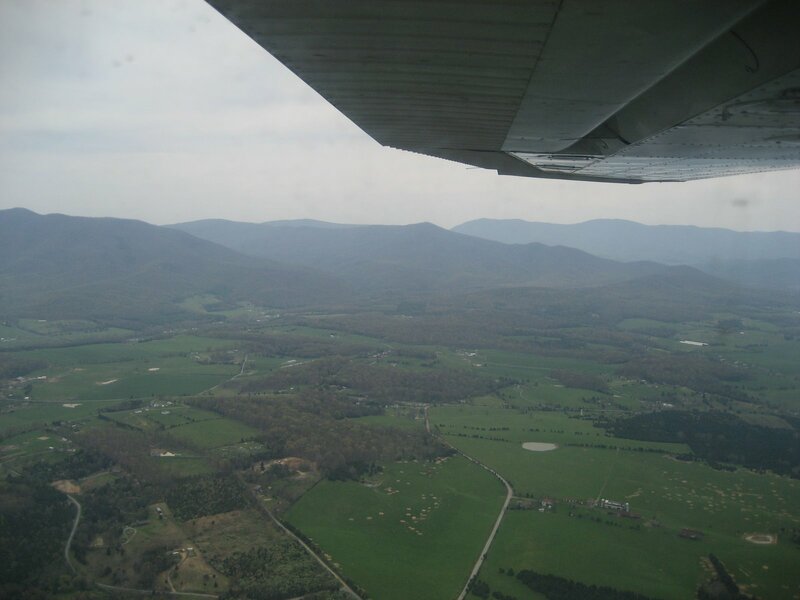 We flew west until we were clear of the ADIZ, then climbed to 4,500 feet and headed south toward Luray, Virginia. It was right about that time that Liam removed his headset. I signaled for him to put it back on, and asked him if he was alright. It turned out that the clamping pressure of the headset hurt his head so that he preferred to fly without it despite the noise in the cockpit. 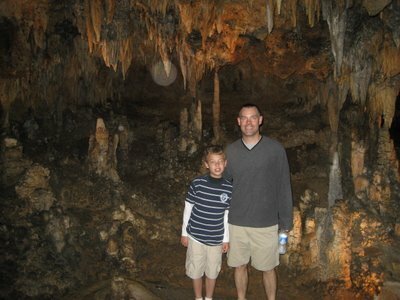 We continued south down the Shenandoah Valley, mountains lining our route on both sides. Below us, we saw gliders flying and being towed, the bends of the Shenandoah River, and the power plant that provides electricity for much of our area. After about 40 minutes of flying, we landed in Luray (W45). As we taxied off the runway, the FBO called onthe radio to ask what they could provide. 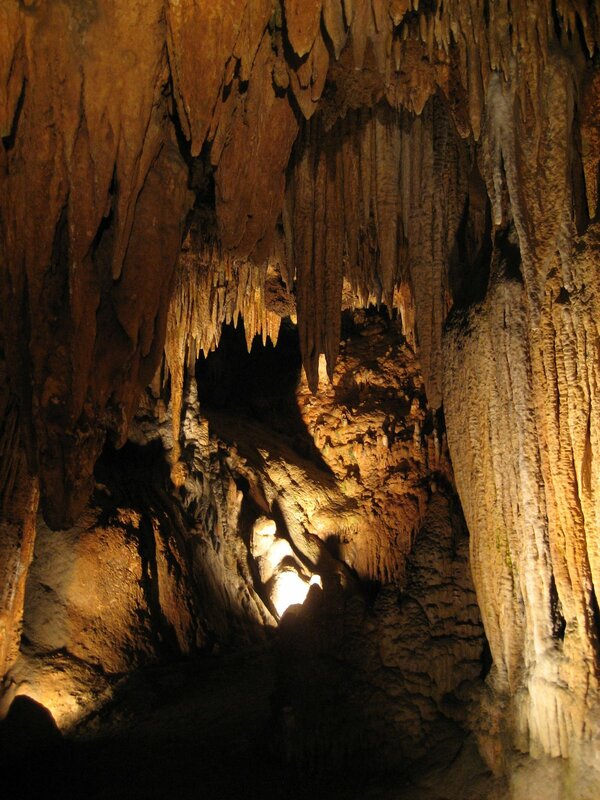 I asked for a ride to Luray Caverns. We tied the airplane down and loaded into the free shuttle for the 10-minute ride. As commercial as it may be, Luray Caverns is definitely worth a visit for anyone who finds himself in the vicinity. The caverns are enormous, very old, and beautiful. 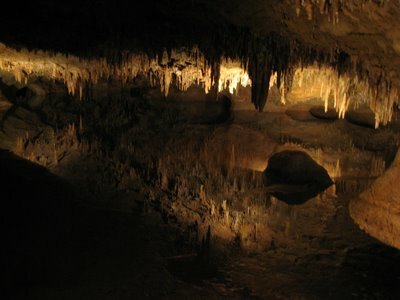 They are now lighted with electrical lighting, and I cannot imagine what it was like for its discoverers to explore it with only flickering candles and lanterns. After lunch, we called the airport for a shuttle ride back to the airport, then got ready to depart. Liam and Bill switched headsets for the flight home, which allowed Liam to wear it for longer periods without discomfort. As we climbed away from the Luray airport, Liam took the controls to try his hand. It was only then that I realized that he couldn't see the horizon over the instrument panel. I thought for a moment, then told him I'd teach him to fly by instruments. I explained the altimeter and vertical speed indicator, and asked if he could keep the airplane right at 3,500 feet. He did a great job, keeping our altitude in a sinusoidal wave that bracketed the desired altitude by 300 feet or so and gave our stomachs that funny feeling of weightlessness. "It's hard!" Liam said. 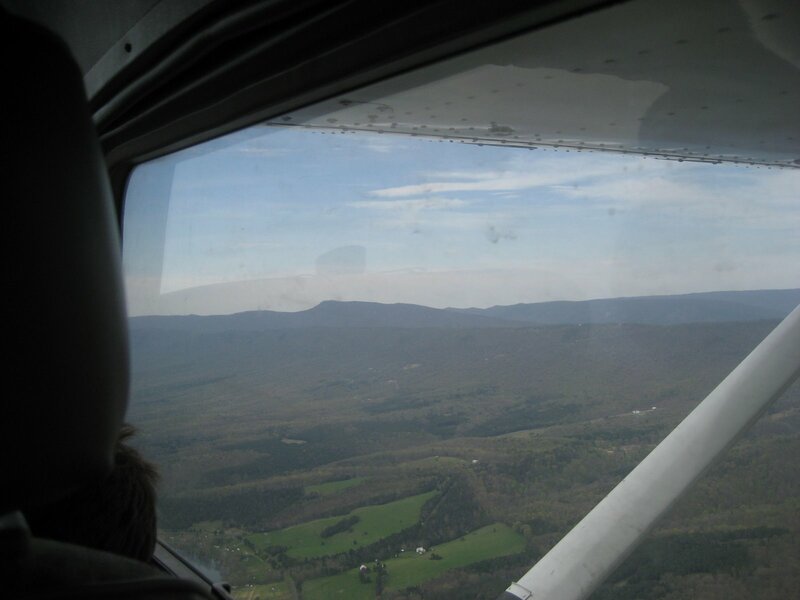 I had kept my hand on the yoke to keep us from deviating too far from a straight and level flight attitude. As he got better, I pointed out the attitude indicator and explained how it showed whether our wings were level. He worked at it for a couple minutes, then announced he was taking a break. "It's really hard to do all three," he said, a big grin on his face. I flew us back into the ADIZ and toward Gaithersburg. 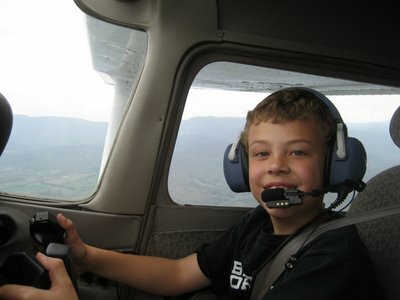 Liam, headset off, fell asleep to the droning of the engine, head tipped over against my shoulder. Bill and I chuckled through our headsets. The wind was from 170 at 11 knots, gusting to 15 knots, but I lucked out and had a baby-soft landing despite the gusting crosswind. We taxied to the parking spot as Liam awoke. "We're already here!" he said. I've flown with a bunch of people on my list, but a lot of people have also been added, so it was time to update this list.